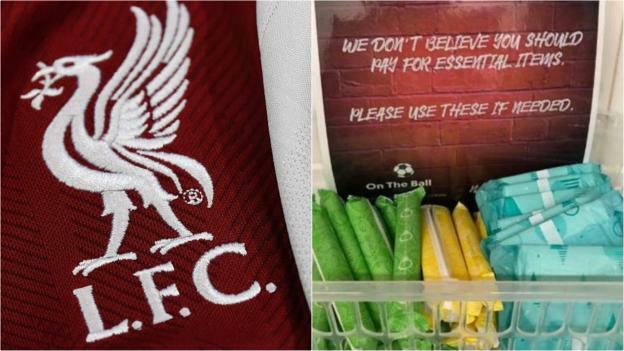 Liverpool have become the fifth Premier League club to provide fans in their stadium with free period products. The Reds have joined Brighton, Huddersfield, Fulham and Everton in signing up to the ‘On The Ball’ campaign, which was set up by three Celtic supporters earlier this year. In total, 45 clubs across the UK have signed up to the campaign. “A club like Liverpool getting involved is absolutely amazing,” On The Ball’s Mikaela McKinley told BBC Sport. Following a successful trial during Liverpool’s home fixtures with Manchester City, Red Star Belgrade and Cardiff, in which baskets of free sanitary products were available in toilets in Anfield’s Main Stand, the scheme will be rolled out across the stadium. Products will be available in all ladies’ and accessible toilets in either ‘free-vend’ machines or baskets. “Period poverty is a very real issue and one that no-one should have to face,” said Daniel Gallo, Liverpool’s HR director. Earlier this year, McKinley, Orlaith Duffy and Erin Slaven successfully campaigned for free period products at their own club, Celtic. “We’re absolutely buzzing with how the campaign is going,” Slaven told BBC Sport. “We never imagined it would go this far and we are still totally chuffed every time a new team gets on board. We are delighted with the progress the campaign has made.